Enhance the beauty of your home, inside or out, with this long-lasting, contemporary, Metal LED Lantern that can be hung or stand alone. 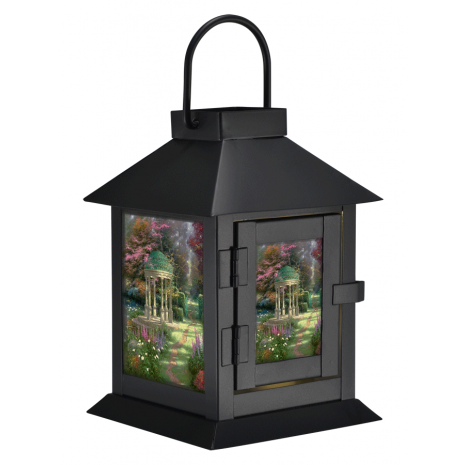 This elegant Coach Lantern features a battery-operated, plastic Flame-less LED Candle that provides a safe, beautiful glow like a real flame. As an added bonus, the lantern’s four glass panels have been inserted with decals of a painting titled “Garden of Prayer” by renowned artist, Thomas Kinkade, that provides a perfect place for those seeking a time of reverent renewal and a moment of solitude to be with their God! In addition, the lantern includes an on/off timer that conveniently turns on at the same time everyday for 6 hours and off for 18 hours. of Thomas Kinkade in his original “Garden of Prayer painting as shown below. by a LED flame-less battery operated candle. This Giveaway is valid in the Continental United States Only. so will result in another winner to be drawn.